Pysanky (pysanky-plural, pysanka-singular) is derived from a Ukrainian word meaning "to write." Pysanky are eggs (either whole raw eggs, or hollow) which have been decorated with a wax-resist method where one draws (or "writes," as Ukrainians would say) those portions of the design which you want to remain the color underneath the wax. A small, hollow funnel attached to a stick is used to heat the wax and write with. This tool is called a kistka. 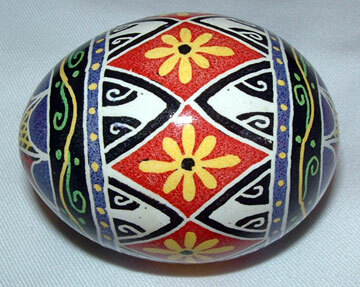 Archeologists have discovered ceramic Pysanky in the Ukraine dating back to 1300 B.C. They have linked Pysanky designs to those of Egyptian ceramics created in 1500 B.C., and to symbolism of the Trypillian culture in Ukraine of 3000 B.C. Six thousand years ago, the Trypilljan culture flourished in Ukraine. The society existed 3000 years before biblical Abraham and long before Greek mythology and the Bronze Age. Trypilljan people lived in the land of Ukraine at the same time as the Egyptian pyramids were built. The Trypilljans were a matriarchal society that worshipped "mother earth" and had little interest in power struggles concerning politics, taxes, money and ruling, as in patriarchal societies. In both design and color, Trypilljan symbolism echoed the people's close attachment to the soil and other elements of nature. Ukrainian symbolic art is based, in large measure, on these early ideograms. The most notable example is the Ukrainian meander or unending line, which denotes the cyclical nature of life. Other examples include such motifs as the circle, cross, stars, dots, matriarchal symbols, wheat, fir tree, horse, stag, horns and bear's paws. With the acceptance of Christianity in Ukraine in the year 988 A.D. pysanky became a part of the Christian tradition of Easter and now took on the meaning of the rebirth of man and the resurrection of God. The egg symbol was likened to the tomb from which Christ arose. There is no point where we can determine where the pagan beliefs and customs of pysanky end and where the Christian symbolism begins. In reality a subtle blending of both has occurred. What is a symbol on "pysanka"? It is a word picture, an ideogram, a code, containing the secrets of a culture. More effectively than words it reveals feelings: love, happiness, hope, dread, despair, etc. To those who understand symbolic art, it means something, and to those who cannot decipher the code, it remains a mystery. 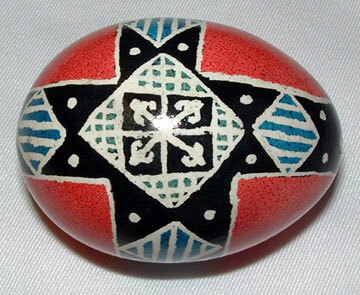 The sense of mystery is inherent because each pysanka involves a trinity of symbolisms: the symbolism of the egg itself (life), the symbolism of design, and the symbolism of color. 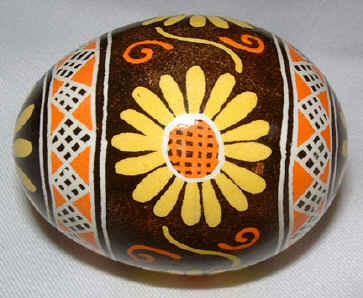 The tradition of decorating eggs, especially at Easter or in spring, was widespread through Europe. 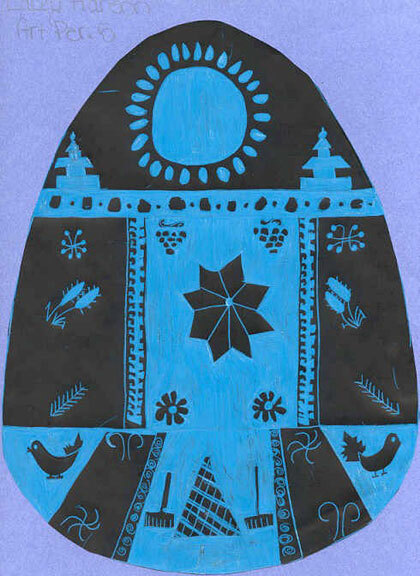 Nowhere, however, did the decoration of eggs become so vital a part of a society’s culture as it did in Ukraine. The people in Ukraine came to see the egg, now referred to as pysanky, as a talisman. Pysanky became part of daily life and were believed to possess power. The practice of giving pysanky became part of the Ukrainian tradition and also served as a means of preserving and continuing the art of pysanky itself. For centuries the designs and symbols used on pysanky were handed down from mother to daughter. The cultural heritage of the Ukrainian nation was entrusted this way. 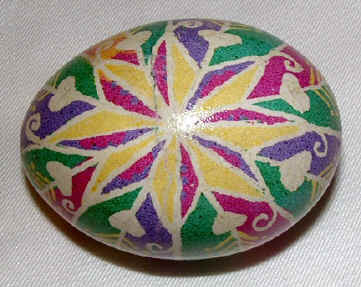 In a similar way the traditional approach and the modern one has blended for pysanky artists. When the equinox neared and later, after Christianity, when Easter neared, women would set to work creating just the right pysanka for each loved one. Pysanky used to be made at night by women only when the rest of the household was asleep. 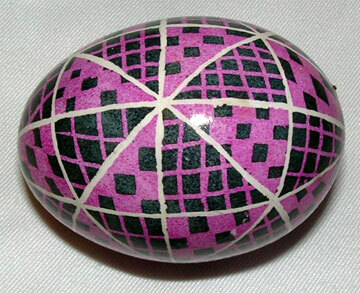 Before a Ukrainian woman could begin a pysanka she needed to be in the right spiritual frame of mind. The day prior to her beginning her pysanka she would spend a day "without sin", avoid speaking ill of anyone, would exercise patience in dealing with others, and she would tenderly care for her family. No one was allowed to observe her creating her pysanka since the sole purpose of pysanky art was to ward off evil. She would speak certain prayers to ensure that this pysanka would bring wealth, protection or other goodwill to the recipient. This was a mystical expression of the Ukrainian people. The concept has evolved and now, although there are some who maintain a strict traditionalist view, pysanky has joined the ranks of other art forms as a personal expression of the individual artist. But what hasn’t changed are the links to an ancient culture and all the symbolism and heritage those links imply. Ukrainian Easter Eggs and How We Make Them - A colorful book about pysanky showing hundreds of designs never before published. Symbolism, traditions and techniques are discussed in detail. Over 250 eggs are photographed in color. 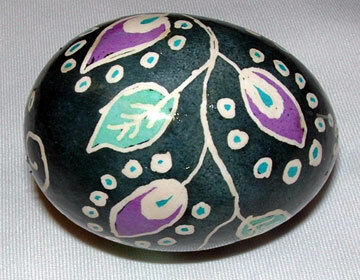 Decorating Eggs: Exquisite Designs with Wax & Dye - Pollak's projects are an eclectic selection of designs from many cultures, all applied to eggshells by using a wax-and-dye technique similar to batik. The Splendid Art of Decorating Eggs - Easy-to-follow directions and diagrams for nearly 100 projects — lacquered eggs, Christmas egg wreath, exquisite Fabergé-style creations, and many more. We will be creating several Pysanky eggs in class. You will need to bring egg to class. Eggs can be raw (finished eggs are not edible) - you can blow out the eggs once they have been completed, OR eggs can be hard boiled. One roll of paper towel (you will use a lot of paper towel for each egg). A hair elastic if you have long hair. Part A: Draw out 2 TRADITIONAL designs. You will need to draw both the front and the side of each, on the page provided. Use the images provided in the workbook as your inspiration. Figure out how the egg needs to be divided. Decide what colors you should use (have a look at the pages displayed in the classroom for colors the original artist used), and what order they should be dyed in (remember, always dye lightest to darkest!). Color the images using pencil crayons or markers. Part B: Draw out 2 ORIGINAL designs. You will need to draw both the front and the side of each design, on the page provided. Use the workbook to research symbols and colors. Both designs should have personal meaning, using traditional symbols/colors. Color the images using pencil crayons or markers. Finish the worksheet by describing what the egg designs mean. 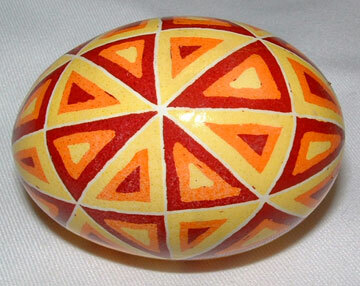 Ukrainian Easter Eggs Gallery - a large selection of images on Pinterest. Present an introduction to Ukrainian culture (via PowerPoint) - show actual examples of professional Pysanka Eggs (if available) - or show PowerPoint. Have some of your own examples on hand. Provide some time for students to do independent research (via the Internet). See intructional DVD. Explain and demonstrate additive dye process - working from light colors to dark. Do a sample right along with the students. Apply wax to any area to be left white and dye in first color (lightest color) - blot off excess dye on paper toweling - allow egg to dry completely. Write reflection - include symbolism of color and designs used. 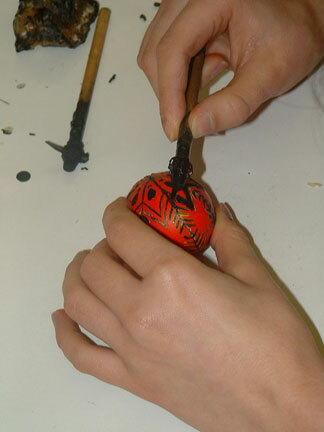 Here a student has already dyed the egg red, and is continuing to draw onto the egg with wax. Where ever new wax is added, the egg will stay red. Here a student is dying their egg blue. Yellow was first color and the areas to remain yellow are now covered with wax. 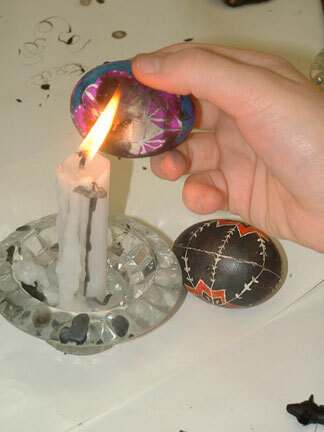 Here student is melting off the wax from the egg using a candle. This is a very slow process. As the wax is melted and wiped off, the colors underneath are revealed. Use of the elements and principles of designs: repetition, pattern, movement, balance, etc. NOTE: While the history above is shown on multiple sites - it is copyrighted information. Olga obtained the history from the Ukrainian Catholic Church. Permission has been granted to publish here for teachers to use with students. Permission can not be granted to publish it elsewhere. Olga has also granted permission to post the symbolism file linked to this lesson. Her site was used as a resource. Permission can not be granted to publish it elsewhere. Contact Olga directly. 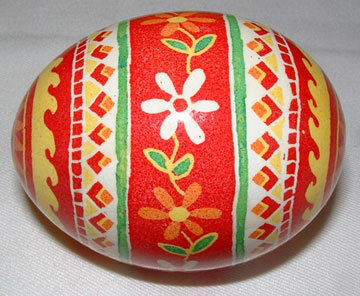 Pysanky Dyes -These are specialty dyes that are available through Ukrainian Stores. Sometimes (usually around Easter) you can find them at Michael's Arts and Craft Store. (See one online store) These dyes are toxic if consumed (so the finished eggs can not be eaten!) but are fine for students to work with. The dyes are sold separately, and I suggest using only the basics to start. At the store (but I would recommend yellow, orange, red, green, black as the basics) there are many other colors like scarlet, and dark red for example. Dyes can be saved and used again, however, they do not last forever. Yellow and Orange tend to go bad quickly. We can usually use the dyes for two years before making new, however, by the second year, the colors are less intense and the eggs require longer times in the jars. As the dyes are not that cheap (we use a lot of colors) we try to make them last as long as possible. We usually make new yellow, orange, and black (because you want a strong black) every year. Be very careful when mixing the dyes - make sure the powder does not get onto your counter (if you are doing it at home) and mix with liquid as it will stain! Put newsprint or newspaper down! Kistkas - These are the tools that are used to draw the beeswax onto the egg. These are available where ever you find Pysanky materials. They are usually a wooden handle, with a very small copper funnel tied onto the end of the handle with copper wire. They come in different sizes (I would not recommend extra-fine for students) and we usually use fine, medium, and heavy. You will need a quantity of Kistkas. Students will usually use fine for drawing of lines, and then either medium or heavy to fill in. If you are investing in a class set, purchase at least one fine per student, and then some medium, and some heavy (as these can be easily shared). Beeswax - This must be pure beeswax. You can buy it where ever you are getting the rest of the Pysanky materials, however, is much cheaper if you can get in contact with a bee keeper. Buy a big block of real beeswax and then just chop it up with a really big knife! Candles and candle holders - You will need 1 for every two students at the least (it is better if they have one each, however.). Candle holders can be picked up cheap at dollar stores as well as candles. If you are buying the large taper candles, cut them in half, as the height does make it difficult to use. I recently bought the 'emergency home' candles from the dollar store which are about 6 inches tall. I got 8 for a $1 so it was very cost effective. You will need at least one candle per student, depending on how long you will be working on the eggs, you may need to replace candles as you go. We do the eggs for three days, 75 minutes each day, and I usually replace at least ½ of the candles in that time. I usually buy the heavy glass candle holders - nothing fancy. Matches - A barbeque lighter (the ones with the long end and the trigger) will work also. Paper Towels - School grade paper towel is NOT advisable - it will scratch the beeswax on the egg. Purchase some good paper towel, or have the kids each bring in a roll. 25 students, creating eggs for three days at 75 minutes each day, plus some who stayed over the lunch hour...used 10 large rolls of paper towel (I bought one of those bulk bags of 12 rolls at the grocery store). White Newsprint (NOT newspaper) - Cover the tables with newsprint (I use regular school grade drawing newsprint). The working tables where the students sit should have 2 layers (students can actually 'draw' with the kistkas and beeswax onto the table for practice). The Dye station (I put all the dyes in one place for control) should have much more paper on the surface (I think I usually do 8 layers or so). Pysanky dye can stain tables! Warning: newspaper will transfer the ink onto hands and then eggs. Jars - You need to mix the dyes ahead of time (they are made with boiling water) so that they are cold. You will need jars with wide mouths - pint canning jars work best. I have been collecting jars for pasta sauce. 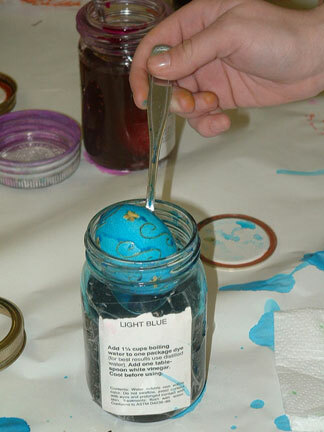 Don't use really big jars, as the dye doesn't create enough depth at the bottom of the jar to cover the egg. I wouldn't work larger than a regular pasta sauce jar. Vinegar - The dyes need to be mixed with WHITE vinegar. Each dye takes one tablespoon. Eggs should also be washed in a vinegar solution (I do a bowl of water to a splash of vinegar for the kids) to remove any impurities from the eggs, allowing for better dying. Spoons - You will need one large spoon (a soup spoon) for every dye color. These should never be used for consumption again - Pysanky dyes are toxic! Eggs - White chicken eggs - be careful not to buy brands that have the 'stamp' on the egg. This can not be removed and will interfere with your design. Brown eggs do not work as well - difficult to get good colors. Eggs can be hard boiled (if they are to remain unvarnished) or raw. Do not use blown eggs (as they need to sink into the dyes, and blown eggs will fill up with dye). You can blow the egg afterwards. Hardboiled eggs can not be varnished, and will dry out over the years to eventually have a small 'pea' in the inside (takes decades!). Finished eggs should be stored in cardboard egg cartons, and then somewhere where they can breath (if they still have the egg in them). Do not put eggs in 'Rubbermaid' if they still have yolks in them! Eggs can stay raw (this is the traditional method), and the egg will eventually dry up (it takes decades!) but this is the most risky - they can 'explode' through pressure of the gasses which build up in them. I recommend blowing the eggs after they have been varnished. Egg blowing device - If you are shopping at a Ukrainian store which sells Pysnaky supplies, look for egg blowing devices. I recommend one in a green box (can't think of the name) which contains a yellow pump with syringe tip, and a small green hand 'drill' which looks like a green piece of plastic with a nail type head in the one end). Drill one hole with the green drill, and then use the syringe to pump air into the egg which will force out the egg. Then pump water in to rinse. I do NOT recommend mouth blowing, as the dyes are toxic! Oil-based Varnish - If you are planning on blowing the eggs - you need to varnish the eggs first (as the dyes will be damaged by water (and egg). You must use a oil based clear glossy varnish - water soluble ones will cause the dyes to run. You will also need drying stations All I do is push thumb tacks through a box lid (photocopy paper box lid works good) in groups of three, so that when the lid is sitting on a flat surface, all the tack points are sticking up). The eggs are then balanced on the points of the tacks. I would also recommend latex gloves to do the varnishing, so that you don't have to wash your hands in thinner (you put a little varnish into the palm of one hand, then roll the egg around in the hand to coat the egg with a very thin coat of varnish. Use the resources above or make a packet of design symbolism for each table. 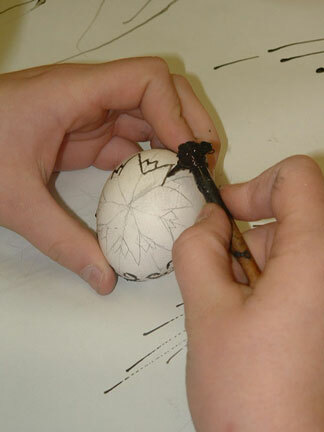 Students design an original egg on newsprint combining their own ideas with the traditional symbols. Transfer design lines to Scratchboard and scratch out a good balance of light and dark. If using white and black scratchboard, students can hand color the white spaces with watercolors or colored pencils. (click image for larger view. One new idea would be to do the basic color design with marker or watercolors...then do the scratch board on the new clear scratch paper. Layer the scratch design over the colored drawing... OR do any kind of coloring (like loose wet in wet... marbling... whatever) and layer the scratch design over. Another idea would be crayon resist - White crayon line with watercolors. Students can use some of the traditional symbols combined with their own.